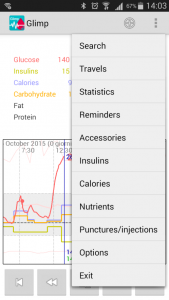 Glimp, the first app in the world to share remotely blood sugar levels of FreeStyle Libre. it will do the rest. Welcome and thank you for using Glimp! This document is a short guide for learning how to use all functions of Glimp, so let’s start! The values in the first column are the sum of the values for the current selected day in graph. The values in the second column are the daily average values calculated on all registered data. You can touch the graph to select an instant in time and see the actual values on that time. You can also swipe the graph to fast move in past or future times. Move in the future of one day (24 hours). To read Libre sensor data, you have to move the back of your device very near the sensor. If you move the front of device it will not works, because the NFC sensor is positioned on the back of the device, near the mobile back camera. To read sensor data you must move the NFC antenna of the smartphone very near the sensor. The NFC antenna position vary from device to device, by example on Smasung smartphones it is positioned very near the camera on the back of the smartphone. Also remember that Glimp is able to read an already started sensor, but it’s not able to initialize a brand new sensor. 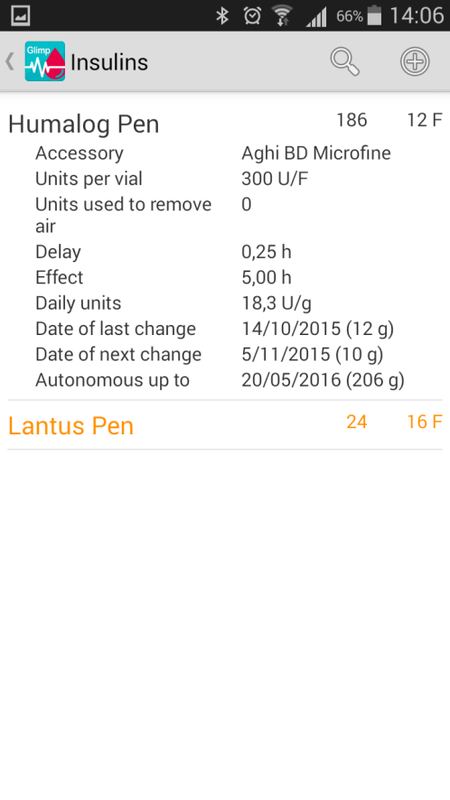 If you’re using a new sensor, you have first to initialize it with Abbott Freestyle Libre original reader. The device doesn’t make any vibration: the mobile has not detected the sensor, either because NFC is not enabled or the sensor is too far away from device NFC sensor. Abbott reader applies correction algorithms to glucose values read from Libre sensor. These algorithms are property of Abbott and are not accessible. To compensate errors of raw glucose values saved in the sensor, Glimp makes a manual calibration of values. 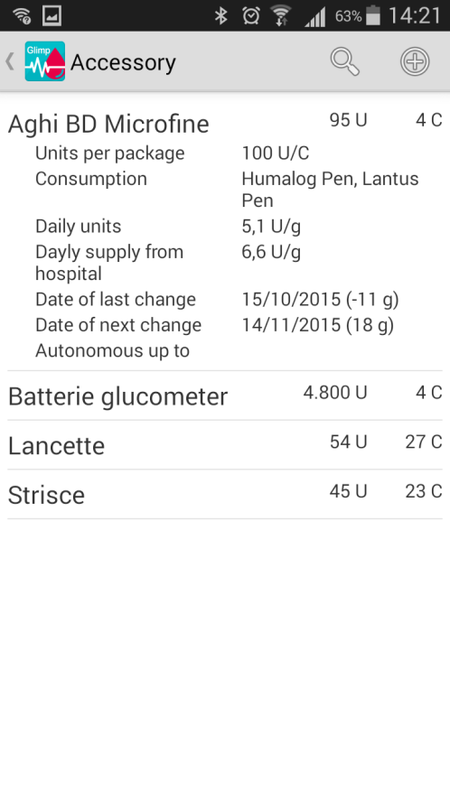 To activate calibration you just have to insert some manual glucose measurements in the app. 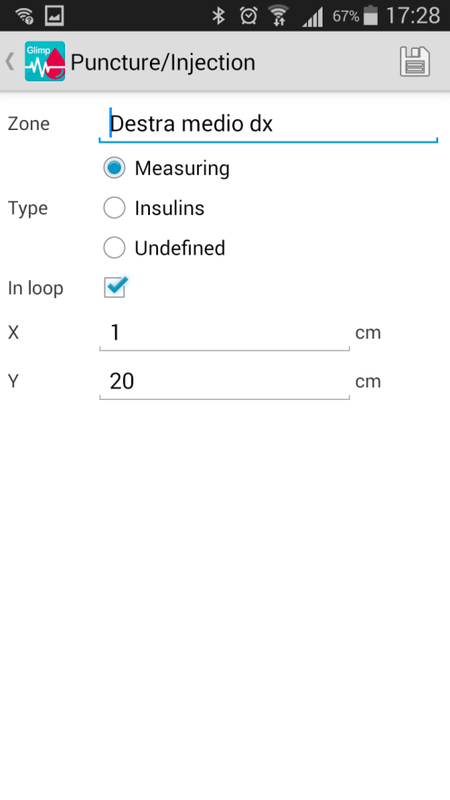 Glimp checks automatically inserted values and when the number is big enough it corrects the glucose values read from Libre sensor. In most cases it’s enough to load 3 or 4 manual measurements to trigger the calibration. Glimp is connected with Dropbox. Connecting Glimp to your Dropbox account you will be able to save your Glimp data files in your Dropbox folder and connect all Glimps installed to your devices and share your data on them. Connect your favourite devices, like smartphones and PC, to Dropbox using always the same account. With this configuration, every time Glimp will save a new measurement on Dropbox, the information will be synchronized automatically on all connected devices, and they’ll show the same data refreshing at every new scan with a maximum delay of 2 minutes. Download from Nightscout “treatments” collection isn’t available. To connect Glimp to Nightscout you must go to options menu and specify your Nigthscout website address and api-secret password. Note: to be able to upload into “treatments” collection it is necessary to enable Nightscout “careportal” option. If this option is disabled, Glimp will upload only data read automatically from Libre sensor and will ignore manual records. 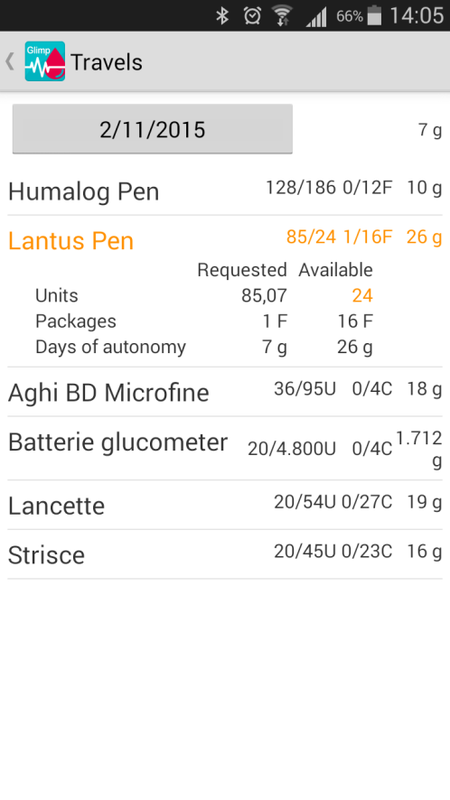 If on the smartphone it’s installed the app Diabetes:M you can configure Glimp to transmit to Diabetes:M all values read from Libre sensor. If you just want to use Glimp with Abbott Freestyle Libre this form is useless. Instead, if you want to record also insulin, calories, manual measuring, this is the form to use! This area contains the main information you may want to record. Glucose Glucose value measured with strips. This value is used by Glimp for calibrating glucose values read by Libre sensor. Measuring zone On which finger you got the blood for manual measure. Glimp checks all fingers used in old records, and propose the oldest finger used. Between parenthesis you can find the number of days from last use of that finger. Injection zone On wich part of your body you made the injection. Glimp checks all areas used in old records, and propose the oldest finger used. Between parenthesis you can find the number of days from last use of that area. Bled Did the injection made you loose blood? Glimp uses this information to avoid to propose the same injection zone before a certain number of days, in this way the wound can heal. Waiting Minutes between the injection and start of lunch. You don’t have to manually calculate this number, just press the button nearby to let Glimp make the calculus for you. This area contains all data related to calories and sport. You can insert how many rows you want, and declare the food you eat or the sport you do. 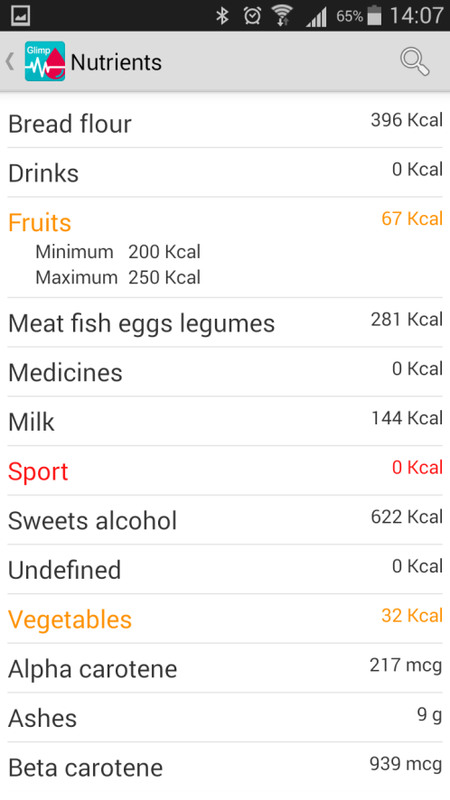 You can declare any food or activity inserted in the calories master data. Negative: you opened packages of the accessory. Glimp uses these information to calculate how many days of autonomy you have, and to warn you when it’s time to go for a refill. Quantity Number of bought packages (positive number) or opened packages (negative number). 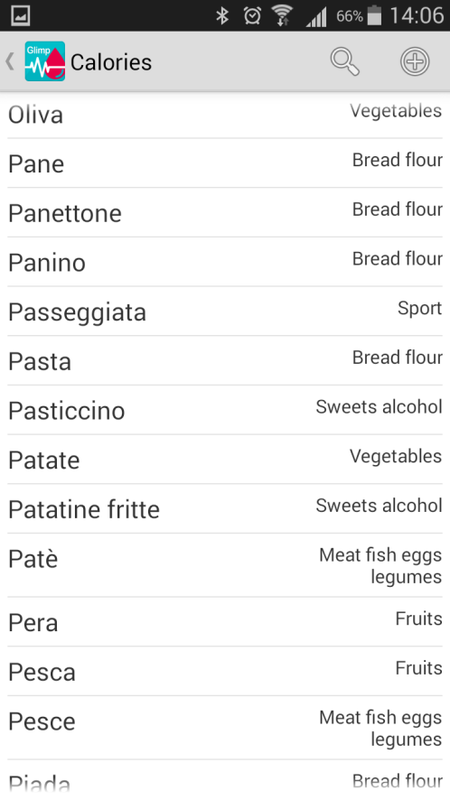 The app for smartphone includes a menu with many functionalities. The functionalities are described in following paragraphs. The search form is for searching an inserted measuring. You can insert a string and this string will be searched in all fields of saved measuring. This form is useful for planning travels. You can specify on the top the planned return date, and Glimp will calculate the estimated number of accessories and insulins required for your travel. In case you don’t have enough accessories or insulins for the full travel, the related row will be coloured in orange, indicating that you need to bring with you new packages or viels. Packages Estimated total number of extra viels or packages required for your travel. Total number of spare vials or package you have. Days of autonomy Number of travel days. The estimated number of autonomy days you will have adding the proposed number of vials or packages. 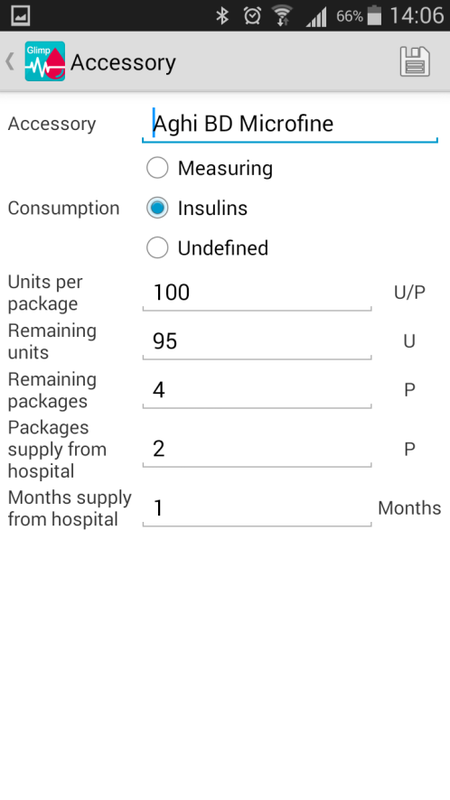 NOTE: the quantities calculated by Glimp are estimations based on the inserted data, but during a travel the quantities of insulin and number of measurements may vary, so check and plan carefully the quantities to bring with you! If the form detect glucose values over limits the smartphone vibrates. The proximity of the smartphone may heat the sensor. If the sensor become too hot it may stop registering glucose values. This form shows various statistics calculated on all saved records in Glimp. Measurements over the upper limit Number of glucose values over the limit saved in Options (Glucose min), expressed in percentage. Measurements in target Number of glucose values in the limit saved in Options (Glucose min), expressed in percentage. Measurements under the lower limit Number of glucose values under the limit saved in Options (Glucose min), expressed in percentage. Stima HbA1c Estimation of glycated hemoglobin, calculated on the average of the registered glucose values.. The value is shown in both % and mmol/mol. 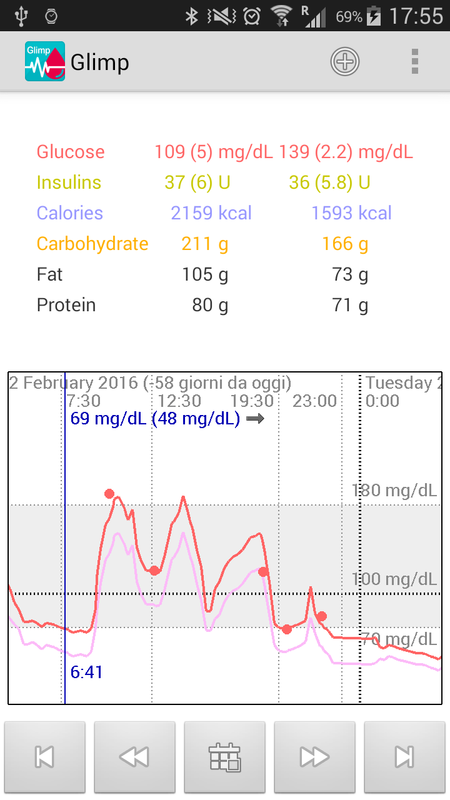 Medie giornaliere Daily values of glucose, insulin and calories. The structure is hierarchical: on the top, in green color, you have the daily average values of the full day. Expanding it, you can see the average values for part of the day (orange color), Expanding further, you fill find the average values of a specific hour of the day. This form contains many reminders and warnings helpful to manage diabetes and Glimp. If there’s one or more important warnings (with orange or red color) the reminders form automatically opens when you start Glimp. 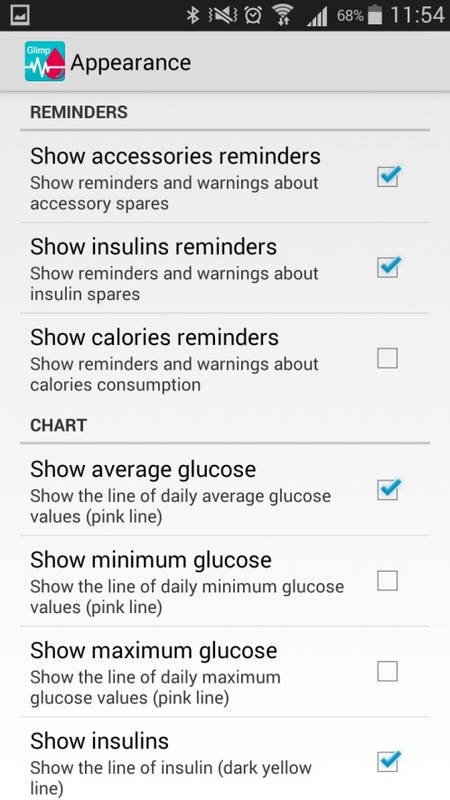 It is possible to disable reminders by group (accessories, insulins calories) in the options menu. This form contains the master data of all accessories you need to have for managing diabetes: strips for glucose testing, insulin pen needles, etc. Units per package How many units you have in one single package of the accessory. Remaining units How many unit you have in your bag (this value is automatically calculated by Glimp, but the very first time you may have to manually declare it). Remaining packages How many package you have in your spare. Date of next change Estimated next date when you’ll have to open a new package of the accessory. This form contains the master data of all insulin you need to have for managing diabetes. Accessory Name of the pen needle accessory used with this insulin. Units per vial How many units you have in one single vial of the insulin. Units used to remove air How many units you waste at every injecton to remove the air from the vial. Delay How many hours takes the insulin to make effect after the injection? You can specify fraction of hours, by example you can write 0,5 for half an hour. Effect How long the insulin make effect? You can specify fraction of hours, by example you can write 5,5 for five hours and a half. Date of last change Last time you started a new vial of the insulin. Date of next change Estimated next date when you’ll have to start a new vial of the insulin. Autonomous up to Long term date when you’ll finish your spare. This form contains the master data of all calories of both foods and sport. Group To which group belongs the food? There’s a fixed list of values. Units of measure Unit of measure used when you eat. Ratio Ratio between unit of measure and base unit of measure. Calories, carbohydrates, fat, protein, … Here you can specify really all values of the food you’re defining. They’re a lot but you don’t have to specify all of them. Just insert the values you know and let all other ones blank. If you specify a value, Glimp will use it in his statistics to check how good or bad is your lunch. This is a read only form, connected with calories form. In this form you can see the list of nutrients defined in Glimp, each one with a minimum and maximum daily value. On the right side of the form you can see the average daily value calculated on Glimp recorded data. Glimp compares this table with the average daily values of the calories you eat, and shows you one or more warning if you eat more or less than the limit value of the nutrient. For measuring glucose with strips you need to make a puncture, and for assuming insulin you have to make an injection. Every puncture should be made on a different finger, and every injection should be made in a different area of your body. Whit this master data Glimp helps you choosing every time a new area where to measure blood and to make the injection. In loop Check it if you want Glimp to automatically evaluate and propose this zone to you when you make a new puncture or injection. X, Y Imaging your body as a map, these are the X and Y coordinates of the body area zone you choose. Glimp uses these values to check if two or more areas are near, and handles them as one. In case of finger, or if you’re not interested in this, just insert big different numbers, as 10, 20, 30 cm and so on. This form let you configure Glimp. Becaus of high number of configurable parameters the form is divided into many sections. Following is the description of options present in all sections. Glucose unit of measure Unit of measure for glucose. Admitted values are mg/dL and mmol/L. Glucose min Minimum glucose value. Values under this value are considered out of target. Glucose max Maximum glucose value. Values over this value are considered out of target. Beep Do a beep when a glucose value out of range is measured. Note: the beep is done also when device volume is set to zero. Measuring latency days Latency time for measuring. All records older than this time will be requested for deletion in the Reminders form. 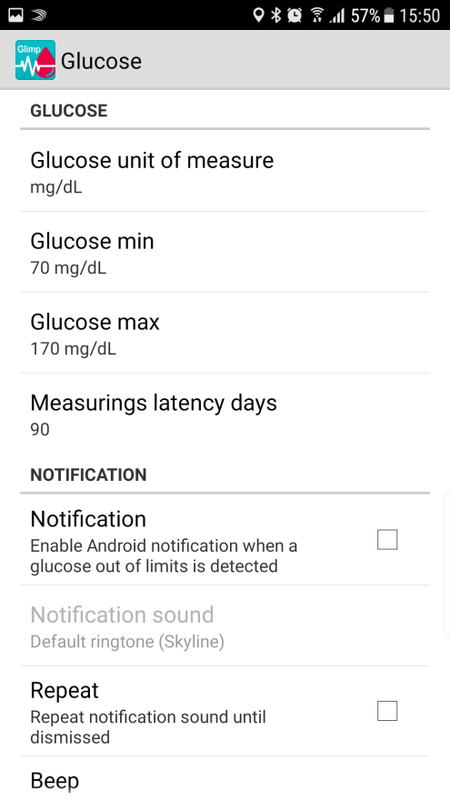 Notification Selecting this option Glimp will generate a standard Android notification every time the glucose goes out of set limits. I use Freestyle Libre Check this box if you use Glimp with Libre. If unchecked, all Libre related reminders will not appear in Reminders form. Usually Glimp saves all 8 hours measuring and most recent 16 minutes measuring. Setting this options instead Glimp will save also all 16 minutes measurings. High data rate On some devices the reading of sensor via NFC is difficult. If you often receive “Tag was lost” or “Transceive error” errors, try to disable this option to slow down communication speed with sensor, this should make transmission more stable. Autostart Selecting this option Glimp will automatically start when you move the smartphone near the Libre sensor. WARNING: if you have on the smartphone other apps for reading Libre sensor or generic NFC tags it is possible that Android will open a screen requesting to select the app to run for reading the NFC tag. In this case unfortunately there’s no way to avoid this screen to pop up. Only options are to disable this option in Glimp or to uninstall the other apps. 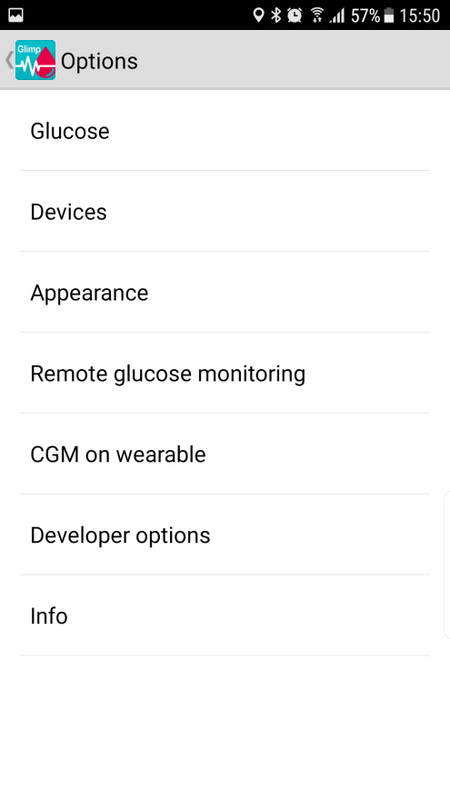 Options in this section are related to configuration of screen of CGM function of Glimp on smartphone. Options in this section allow to remove reminders from reminders form that opens when Glimp starts up. Deselecting an option the corresponding reminders will not be shown. Options in this section allow to show and hide lines in Glimp chart. Deselecting an option will hide the corresponding line in the chart. DropBox You can link Glimp to Dropbox. When connected to Dropbox, Glimp will read and write his data file in your Dropbox folder. This way it’s possible to have a backup of your data in your Dropbox folder, and to share them on more devices, simply connect installed Glimps to the same Dropbox account! Test connection Pressing this button Glimp tests correctness of previous Nightscout parameters. The test requires some seconds for executions and then shows on video the result. Connection You can link Glimp to Diabetes:M app. After connection Glimp will transmit all data read from Libre sensor to Diabetes:M app. Note: the manual values inserted in Glimp are not transferred to Diabetes:M due to limitations in current Diabetes:M interface library. 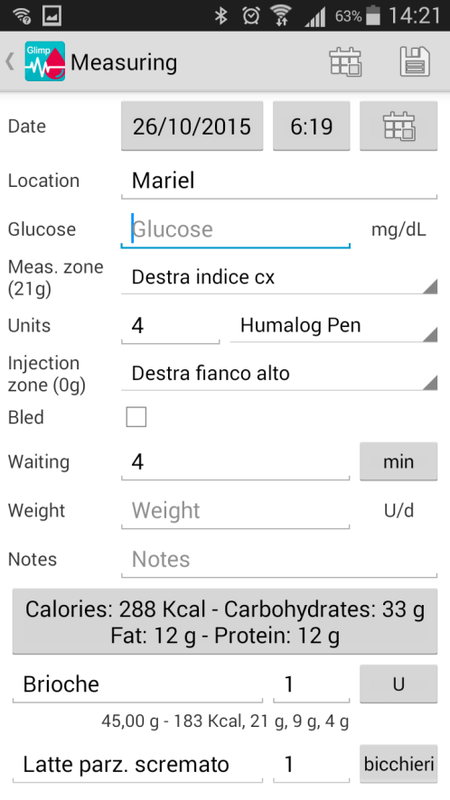 Note: This feature is not visible if Diabetes:M app is not installed on smartphone. In case the smartphone is connected to a compatible wearable device it’s possible to use CGM function on the wearale of Glimp app. This function allow you to read continuosly Libre sensor keeping the device on the sensor. In this section is possible to configure and activate the CGM functionality on the smartwatch. WARNING: you must configure Glimp as clock skin on the wearable to let the CGM function work correctly. Smartwatch Allow to select the wearable (smartwatch) device to use for CGM functionality. Sleep time between glucose checks Set how many minutes Glimp will read the sensor. 3 short vibrations in case of low glucose. Start CGM Start CGM function on smartwatch, After pressing this button on the smartwatch Glimp clock screen you should see appearing “CGM” label. Read sensor now Ask smartwatch to read sensor. NOTE: you may notice communication problems between wearable and smartphone. If this is the case it may be caused by version of Google Play Services installed on wearable devices. In case you can verify in “Frequently asked questions” chapter how to solve this issue. 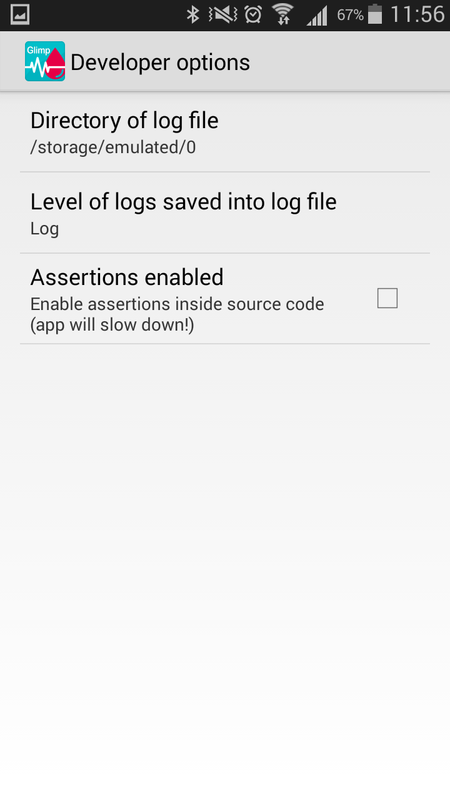 Log level Only for developers: log level for log file: error, log, debug. Assertions enabled Only for developers: enable assertions in source code. Listo f smartphones List of smartphone compatibles and not compatible with the app. Broken sensor reads, grouped by smartphone model. These info are collected to allow support of users asking help about sensor reading and infos about which smartphone may break Libre sensors. Glimp for smartwatch app let you read Libre sensor using NFC chip mounted in the smartwatch. NFC chip accessibile to third party apps. To read Libre sensor move the smartwatch near the sensor. It’s not necessary to start up Glimp, when sensor is detected the app automatically starts. It is instead mandatory to have the screen on, otherwise Android Wear automatically disables NFC as in the smartphone. Glimp for smartwatch sync read data with Glimp for smartphone. 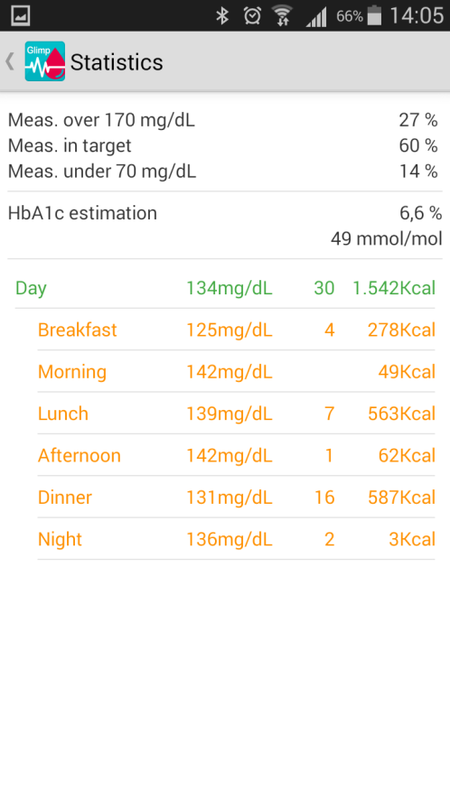 At every reading the glucose values are automatically transferred to the smartphone, and eventually uploaded to DropBox and Nightscout, if configured. 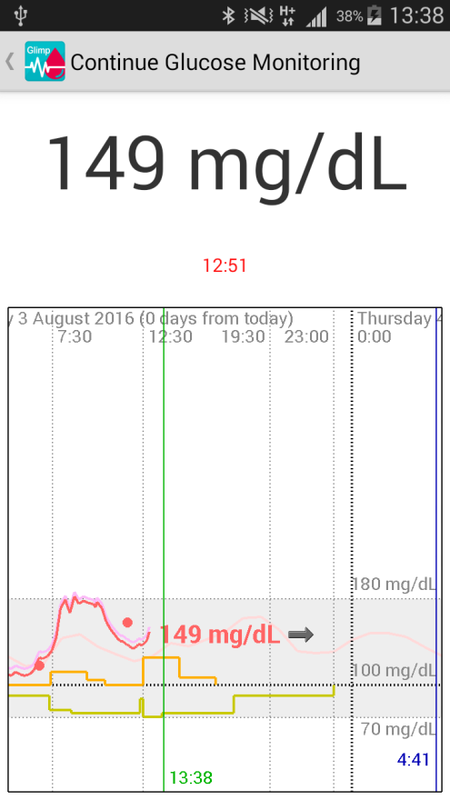 The app shows last read glucose value and the glucose trend arrow. 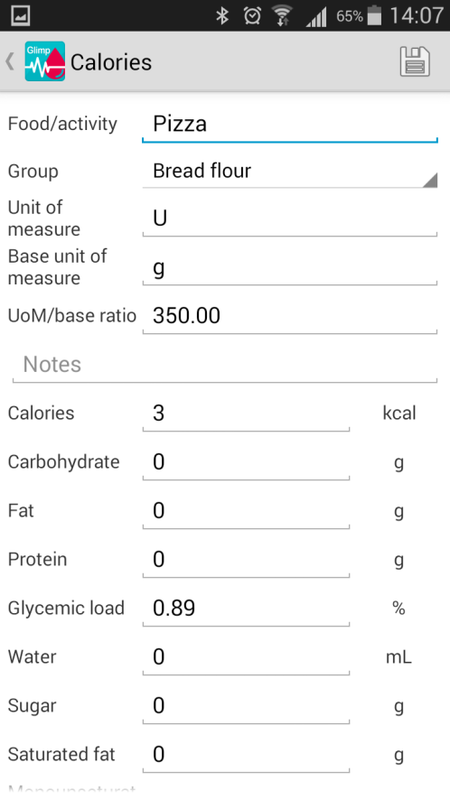 The shown glucose value is the calibrated one, a sit is shown in Glimp for smartphone. 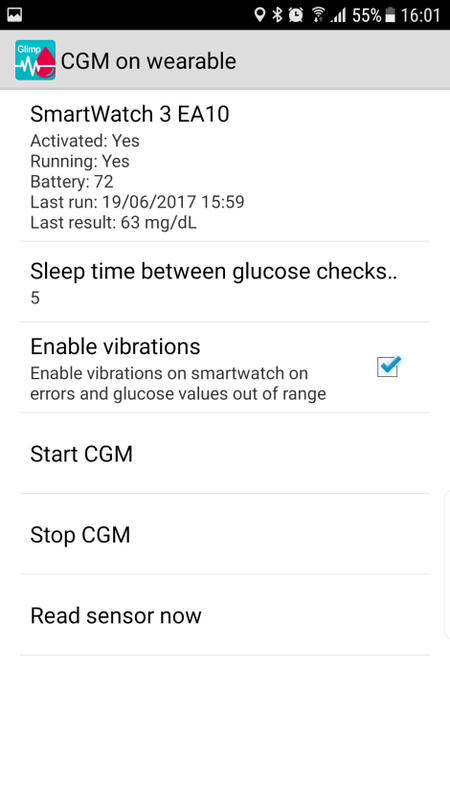 Glimp for wearable can be configured via smartphone to read continuosly glucose values from Libre sensor at fixed time intervals. This way putting the wearable over the sensor you can realize a CGM (continue glucose monitoring) system. See paragraph “CGM on wearable” for more info. Days remaining to sensor expiration, if less than 3. 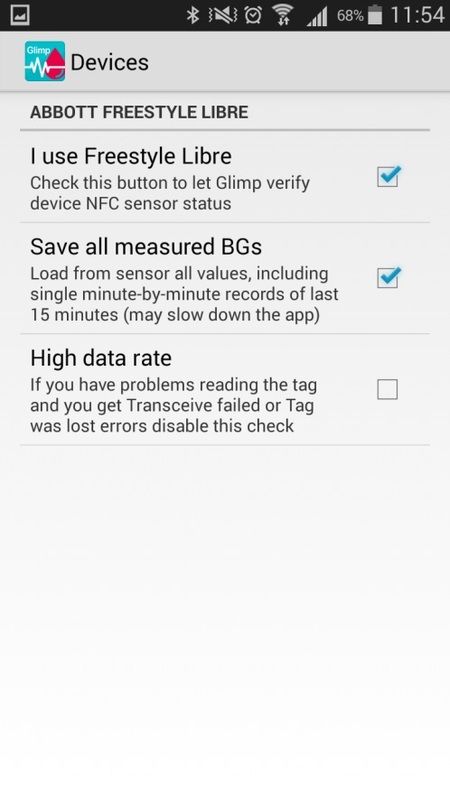 Glimp for smartphone doesn’t read Libre sensor Verify that NFC is turned on. Check that Glimp is active and on his main form. If the smartphone vibrates check the error message shown on screen. For Samsung mobiles: check that the battery has 4 contacts (fourth contact is the NFC antenna contact). If the battery has only three contacts it means that NFC antenna is missing and it is necessary to substitute the battery with an original one. Is it possible to read same sensor with both Glimp and Libre reader? Differently from Abbott devices, Glimp lets you use as many devices as you want. It’s possible to use Glimp for reading a sensor initialized by Libre reader. It’s also possible to use many Glimps, installed on different smartphones and smartwatches, to read same sensor without limitations. Why glucose values shown by Glimp are different from values of Libre reader? Libre sensor internally register only raw values of glucose. Libre reader applyes to these values proprietary algorithms to estimate more correct values. Instead Glimp uses a calibration procedure that uses manual glucose values inserted in the app to correct raw values. Calibration seems to give wrong values If there are few manual measurements it’s possible that calculated calibration parameters are just approximations. 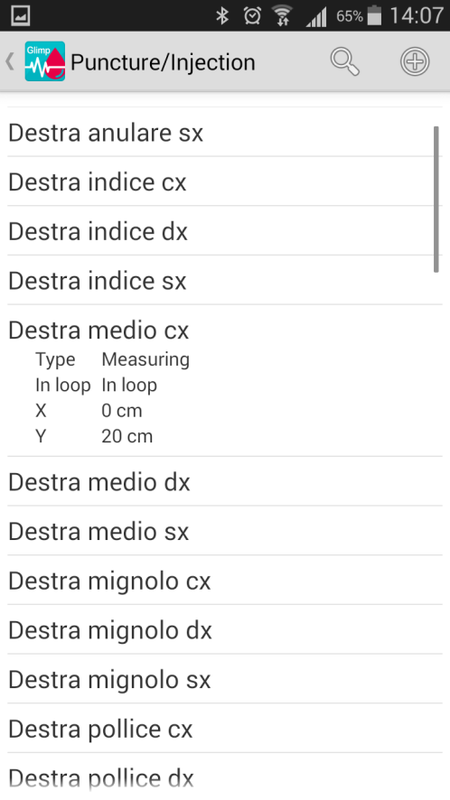 Try to insert more manual measurements in the app. Is Glimp available for iPhone? iPhone includes NFC only from version 6. Apple gave access to NFC chip starting tom iOs 11 on iPhone 7. The Apple library allows only elaboration of NDEF tags but Libre sensor communicate only in binary mode, so unfortunately it is not compatible with iOs. So it’s not possible, at present day, to develop a Glimp app for iPhone. Does Glimp break Libre sensors? Glimp sends to Libre sensor same commands sent by Libre reader. However Glimp uses NFC chips mounted on the Android smartphones where it is installed, and some of these chips seems to create problems to Libre sensors. These problems are not caused by Glimp but by the NFC chip mounted in the smartphone, so the risk is still present also if you use different apps. After many test we found that following smartphones may break Libre sensors, so we suggest not to use Glimp with them. List of smartphones is visible inside the app going to Options / Info / List of compatible smartphones. In the Glicemia.log file there’s the error “500 Internal server error” Error 500 is generated inside Nightscout server and usually indicates a not correct configuration of the Nightscout Azure parameters. If you get this error check that parameters “enabled” is set to: “careportal rawbg iob maker cob bwp cage basal sage boluscalc”. Glimp for wearable does not comunicate with Glimp form smartphone When you root Sony Smartwatch 3 the Google Play Services library is rolled back to version 7 (not compatible with Glimp). Usually the library automatically updates back to version 8 (that is compatible) but sometimes this doesn’t happens. You can check version installed on smartwatch going to setup / information / versions. Execute command [adb install -r “file.apk”], where “file.apk” is the name of the downloaded file. 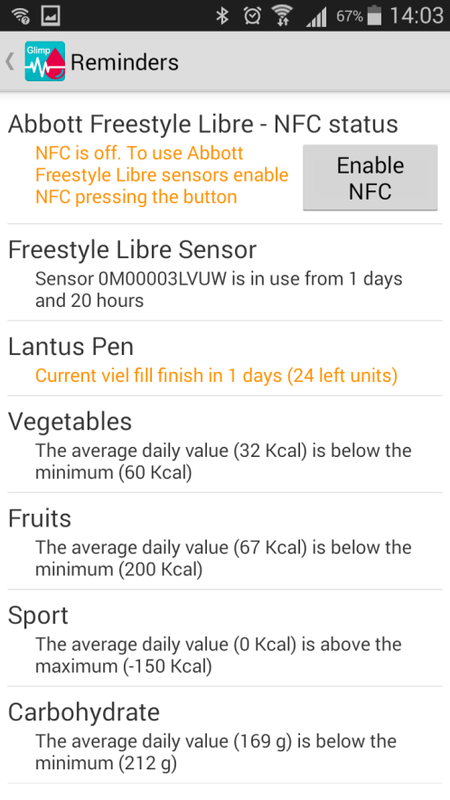 Is It possible to use Android Watch with NFC chip to scan freestyle Libre sensor? Is it possible to install Glimp or at least part of it so The Watch can be use to scan The sensor? A have the same question. Did you find the watch? Hi, this app sounds very exciting. We just ordered the Libre so didn’t have a chance to use it yet. Do you have any plans to add other could services like Google Drive besides Dropbox? Any plans for iOS app? Now, with the integration in Nightscout, you can see remotely with iOS too. Now with ability to use ambrosia bluecon with glimp, it would be nice to have an ios version without Nfc since monitoring is possible anyway! Does it have continuous reading feature if the NFC device is placed near or just on scanning like FreeStyle device? Just scanning (work in progress). The manual is unclear when it comes to synchronization. 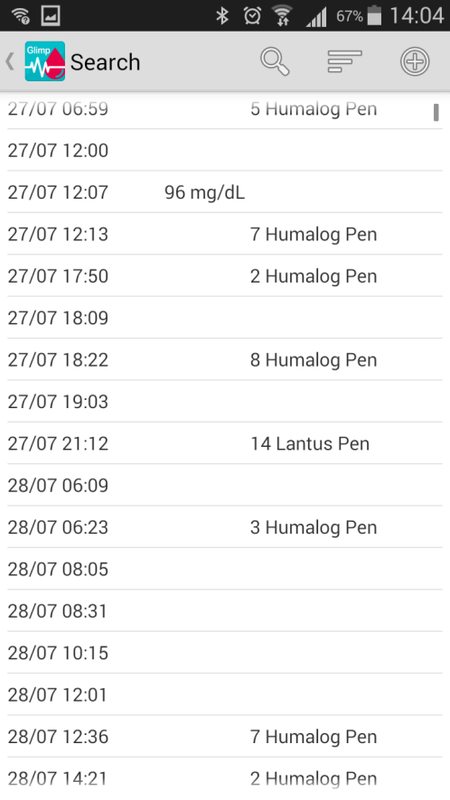 Can I scan the Freestyle libre with one phone using Glimp, send the data to Nightscout and then look at the data in another phone using Glimp that connects to the Nightscout? To synchronize two Glimp apps, you need a Dropbox free account. You cannot via NS. Hello? I have a question about Glimp. What is a smartwatch that can be used to Glimp? Firstly, thank you very much for creating Glimp. This is a huge help for people suffering from diabetes. I am going to buy an Android phone to use with Glimp. Do you have a list of phones which are known to work, or not work with Glimp and the Libre sensors ? Thanks again for creating Glimp! Is there any way to automatically check the sensor? For example, configure the SmartWatch to check the sensor every 10 minutes ? – do I need to calibrate continually, or are a few measurements at startup sufficient? – I’ve been told that Freestyle Libre readings are approximately 5 minutes behind blood glucose readings. How about Glimp readings after calibration? – Will it be possible in the near future to print summaries and graphics? Hello – thanks devs, mostly great job. I have a nexus 5x and tried it with the Libre. All was good for 4 days, but then sensor broke – although I am not absolutely sure whether this was due to your app. Although – possibly it is, since you report problems with Nexus 6P. Any more info on this? / Reports of problems with 5x? Any help much appreciated – as this is close to a perfect solution for me. It is also not compatibele with Nexus 5x. I mailed the developers abd they couldnt say when of if its gonna be supported. Can I help you translate it in Greek? It so great what you have developed. I use it for my son which is 7 now. We wont do print the new glimpbee and use it for the night. Is it possible to get an Alarm on the phone when the Level is too low or too high. Hello! Thank you so much for developping this app! It is trully amazing! However, I was wondering if anyone has experienced any problems using Glimp on Samsung Galaxy A3(6). My daughter (12years old) has been using the Libre for one year without any problem. However, recently all sensors have broke only after a couple of days. This coincided with using Glimp with Samsung Galaxy A3(6). I saw that you don’t reccommend using Glimp on other Samsung models. Could it be related? Thank you very much! Using it with Nexus 5x currently. No issues so far. Also this is a really good app because the Libre I ended up getting was not the real time tracking. It was Doctor version where it would only monitor daily not show current result. This changes that and gives me blood sugar on the go. Thanks for a great app. I just bought a Google Pixel phone and am finding it breaks sensors. It is reproducible, I have killed 2 sensors in the past week. After activating with the official Reader, using it for a while, and then scanning with my phone, the sensor is reported as failed. The Glimp manual mentions a problem with Nexus 6P… I guess Pixel has the same issue. Same problem here. My Pixel killed 4 sensors. Same here, I just tried it on a Pixel (I switched from a Nexus 5 which was working fine) and Glimp now reports that the sensor is broken. I was about to try another sensor but now that I see that ajax0592 broke 4 sensors, I think I know it doesn’t work. Some dialogue with the developers would be handy, as we would be able to isolate what is causing this (for example: does the official Abbott app work with the Pixel?). Question to butako and ajax0592: did you have “high data rate” mode turned on? I tried measuring in both ways before it broke so I’m not sure which of the two (if any) broke it. 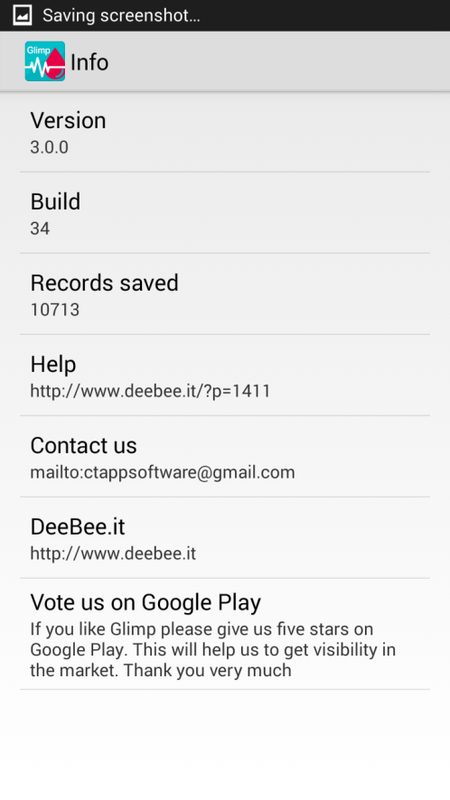 Any word from the DeeBee.it or CTAPP people? Thanks! My first sensor worked 3 days before Pixel destroyed it (25 scans per day). The other three were killed by the second try to scan (within 5 mins). Hi, I have smartwatch LG urban 2 with Android wear and NFC like Sony w3. Who can help me to use on it Glimp? Does not work on Pixel XL. App is unable to read data from the sensor and the app hangs when trying to read data. I have a Sony smartwatch 3 connected to an Iphone 7, and I have installed the glimp app from my computer to the sony smartwatch, but then I can’t change the apps settings, for example the mesurmets in mmol or mg/dl and so on. And I don’t get the Glimp CGM app installed. Is there any way I can get a apk with some kind configuration file added to it? Would be amasing if i could use the iphone notifications and so on.. and still have the smartwatch as an Libre reader. Can I activate freestyle Libre New Sensor by using Glimp? Apple locked the NFC chip of its devices. So, Glimp can’t be available for iOS. Hello. Thank you for the great app! I used it with delight but now have a problem. My smartphone upgraded its android version to 7 and glimp now does not work correctly. 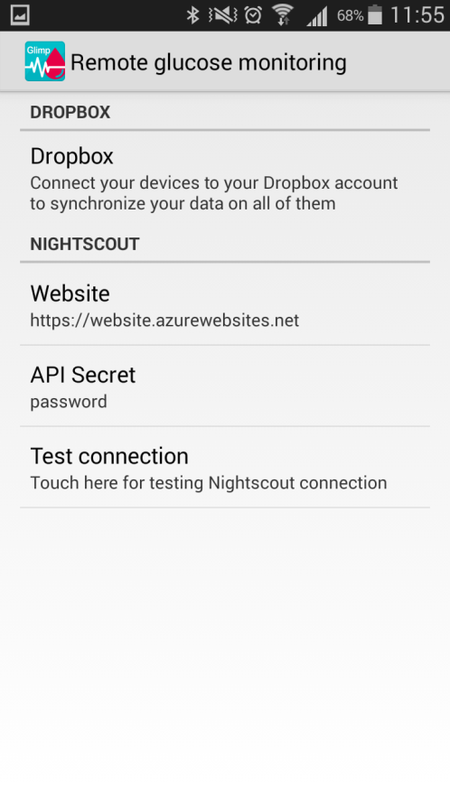 It does not save any measurings and does not send or receive data via dropbox and nightscout from glimp of my daughter’s phone. Can you help us to solve the problem? Good morning. The next version of Glimp will fix the issues with Android 7. We are going to plan the date of this release. When is the release date for Glimp which support android 7. Glimp not reading the sensor on Samsung S8. Will the support added? 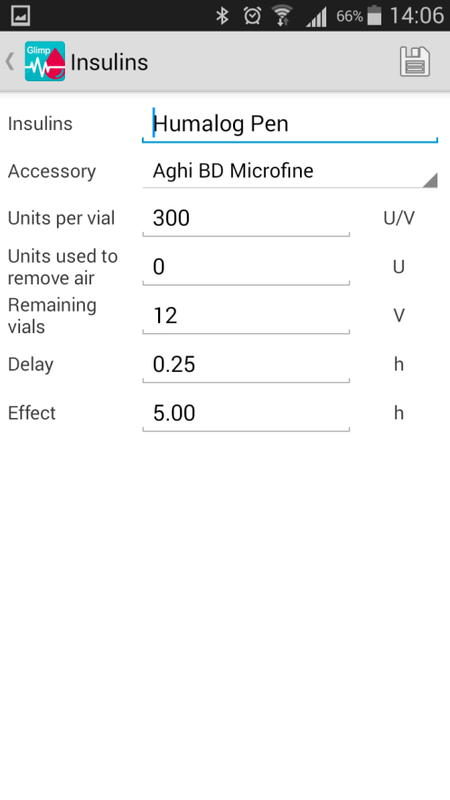 Glimp not reading the sensor on Samsung S8 devices. Because I have no phone with NFC module, I would like to transfer data exported from the Abbot Freestyle Libre Reader as csv, and load it to csv file located in Glimp directory. But till now, the whole structure of Glimp data csv file is unclear for me (I tried to understand it based on values entered in Glimp, but still have some fields with unknown meaning). Could you share the structure of csv file where the data entries are stored, please ? I was trying to read a new sensor and it is not working, it doesnt vibrate or say anything. The sensor is already iniated and everything. What can be wrong? Greetings from Croatia and thank You for Your great work!!!! Write here: info@deebee.it to receive one. Thank you. Hi I am using Glimp and Sony Smart watch 3 (not as CGM at the moment) I have changed the settings on the phone to show mmol/L but the Glimp watch face still shows mg/dl. how can I change the settings on the watch to show mmol/L as well? Update Google Play Services as described above! I purchased new Samsung j5 2016, does the breakage problem of sensor still exists? First thanks for this website. It´s possible change in the app for sony smartwatch the glucose value ?? I had in the mobile app mmol/l but in the watch it´s mg/dl. I have the same problem and no response here. Please help. Hola. es posible que mi sensor sigue funcionando despues de los 14 dias? I run Glimp on phone and Sony smartwatch. 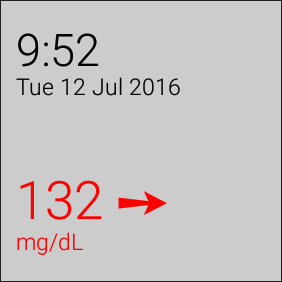 I set unit on phone to mmol/l but on the watch it displays everything in mg/dl. How can I change the unit on the watch? Have you tried with s-8 phone ? 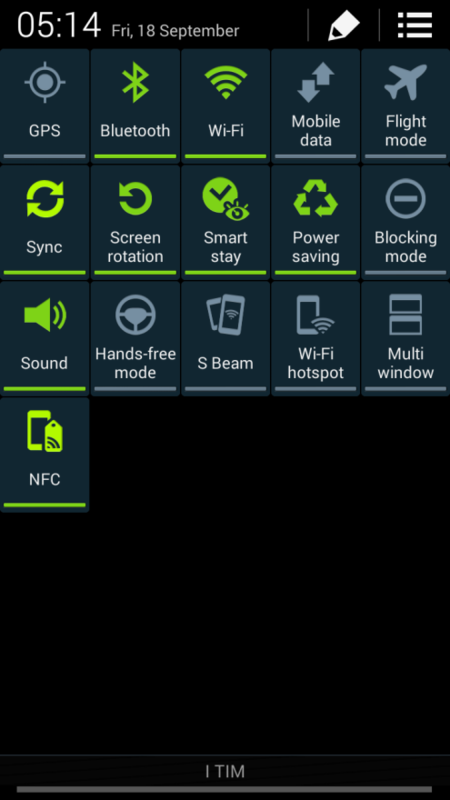 Samsung S8 is not ok.
Is Samsung On8 compatible to Glimp app to read Libre sensor? And now it’s possible to silent the alarms, great! I have setup glimp with a sony smartwatch3. Is it possible to change the reading on the watch from mg/dL to mmol/L like you can on the smartphone app? Hi, just wondering if it’s possible to change the units on the smart watch to mmol/L? I have a question. Sugar values appear sometimes followed by an *. What does that mean? BUT how can I print and send my data to the doctor? Can I download the data as csv file? Can I download and print the chart of a defined period?